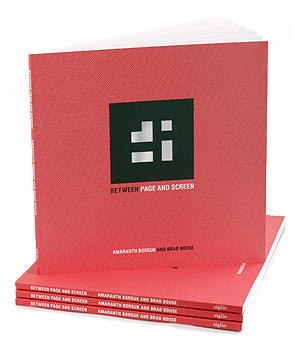 Between Page And Screen is an augmented-reality book of poems. 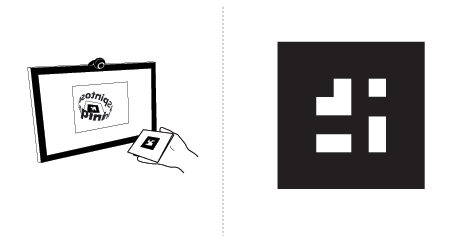 Between Page and Screen has reinvented visual poetry, doing so by displaying hieroglyphs that humans can read only through the eyes of robots. Each coded sigil resembles one of the cellular automata that a mathematician might find in the game of life—except that each glyph has become a cipher for an epistle that explores the sound of words, then explodes these messages into shrapnel. Such a book heralds the virtual reality of our own poetic future, when everyone can read a book while watching it play on television, each hologram standing in its cone of light, hovering above the open page. An unlikely marriage of print and digital, Between Page and Screen chronicles a love affair between two characters, P and S. The book has no words, only inscrutable black and white geometric patterns that, when coupled with a webcam, conjure the written word. Reflected on screen, the reader sees him or herself with open book in hand, language springing alive and shape-shifting with each turn of the page. Originally produced in a limited, letterpress edition of 12, Between Page and Screen is now available from SpringGun Press. Print a preview marker and try it now. Any computer with a webcam can view Between Page and Screen. Print a preview marker and read a sample.